You need to watch the war footage shot by one of the soldiers she befriended. Anne Curtis wanted to tell the story of the brave men who fought hard in the Marawi siege, and who better to show it than one of the great men in uniform who has set foot on the battlefield? 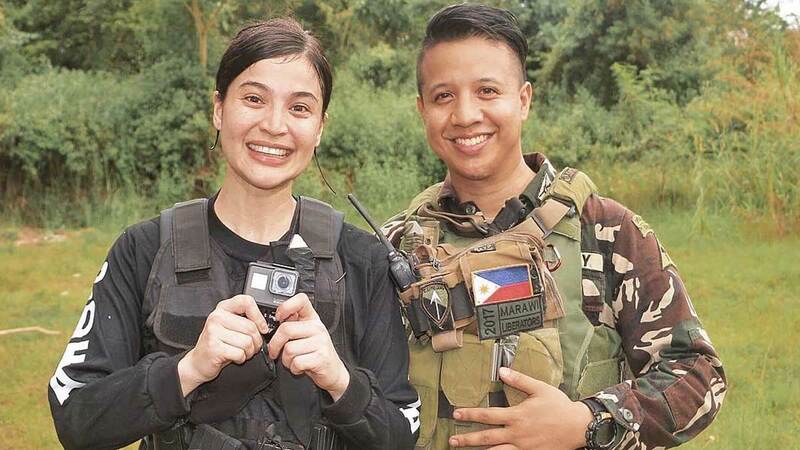 In an Instagram post, Anne saluted 1Lt Bala Tamayo of the Special Forces 134 Vishnu company, whom she met in Fort Magsaysay while in training for her upcoming movie Buy Bust with director Erik Matti. In her post, Anne shared how 1Lt Tamayo has become friends not just with her but with the entire team who went on training in preparation for the movie. This was all before they learned that he and an army of troops were going to be sent to Marawi. In a lengthy post, Anne shared, "I met Bala when we were training and shooting with the Special Forces in Fort Magsaysay for Buy Bust. He happened to offer oral rehydration salts during a very hot day in full battle gear and the rest is history. He became friends not only with myself but with everyone part of the Buy Bust squad. "Shortly after, we learned that the troops were to go fight the war in Marawi. We somewhat kept in touch—which was great because we knew exactly what the soldiers needed during such a harsh time and sent over care packages to somehow boost their morale." Anne included a GoPro camera in one of the care packages she sent over and added, "His request to tell the story and experience the Marawi Siege from the boots of a soldier could not be left ungranted." She went on to say, "His words were—'I’ll return it if I survive this war. If I fall, my buddy will return it. That I promise.' "I told him that I knew he would NOT fall and HE would personally return the GoPro once the war is over...and IT IS OVER...He returned it without even scratch. "So now, I would like to ask all of you to take time to watch the video of the actual war footage he shot with the GoPro I have in my hands in this photo. Watch how all the soldiers bravely fought for freedom and peace..."
"A salute to all the troops that fought hard, fell, and survived fighting for peace in Marawi." Anne, with an online following that reaches over 32 million across different social networking sites, shared a link of 1Lt Tamayo's actual scenes from the battle in Marawi, to paint a picture of how our men and women in uniform toiled to regain peace in Mindanao. We call this an excellent use of influence and reach to tell important stories. What a move, Anne!